The Bodog iPhone casino is one of the most popular places for people to play their favorite games in Canada and around the world. The ability to allow access to all of the most popular titles via the world's most popular mobile phone is something in which the establishment prides itself, and you can reap the benefits by accessing anything you'd like from wherever you are. There are several groups out there who have created suites of titles designed to work with mobile devices, but the Bodog iPhone casino has created one of the most beautiful experiences in the industry. Everything is provided in realistic 3D thanks to Betsoft, and their collection, which is offered through the site, is known as ToGo™. There are 15 different slots from which to choose, all of which have been completely remastered and optimized for this handheld device. Some of these include At the Copa, Under the Bed and even A Night in Paris. Aside from traditional casino offerings, there is also a sportsbook and poker room that can be accessed with the iPhone using the same wallet. 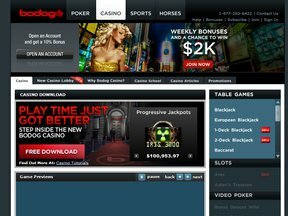 It is free to download and use the Bodog iPhone Casino, but those who want to try to win real money will need to spend real money to do so. Fortunately, the welcome bonus worth up to $600 is a huge help as are all of the other promotions that are on offer weekly as well as monthly. The Thursday Double offer allows you to grab up to $500 in casino chips and there is also a Wild Weekend promotion that will enter you into a drawing for $1000. The loyalty rewards and other offers make this one of the best places to spend your money whether you are interested in the casino, the poker room or the sportsbook - the choice is yours! There is no better place in the world to enjoy stiff competition and excellent payouts. Check out Bodog today and grab your bonus offer!